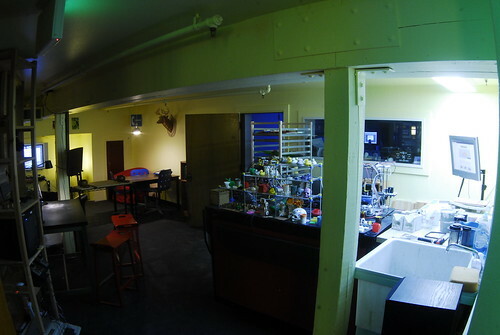 Metrix’s second year anniversary party is coming up tomorrow (be there at 7)! I thought I would take the opportunity to interview a couple of people close to the shop and get their takes on how Metrix has grown and changed, and a little of where the shop is headed in the future. The first person I interviewed was Matthew “Wilson” Wilson. A longtime friend of the owner, Matt, Wilson has “been at Metrix before it even existed”. If you’ve ever stopped by the store on Wednesday evenings you’ve probably seen a group of geeks chatting and hacking away. This is Hacknight (which I’ve written about before), and Wilson has been going to these meetings for at least 10 years. 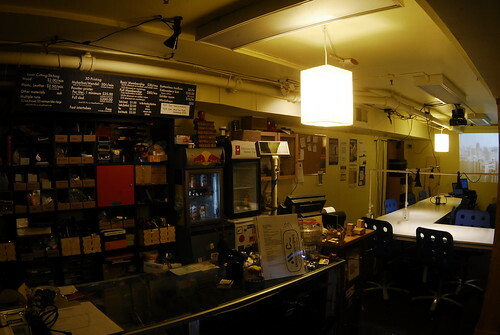 It was at one of these Hacknights that the idea of Metrix: Create Space was born. Those were also some of the reasons that he thinks makes Metrix special. He said it was a safe environment where awesome projects happened. He cited the Clonedels as one of the coolest projects to come out of the shop, but also mentioned one project that never got finished (so you may not have heard about it). A few months ago several people got together to try to turn the giant CNC router in the back into a 3D printer. Unfortunately it eventually ran into some problems, and the project had to be halted. “It didn’t matter that it didn’t work, it was just so audacious”, he told me. 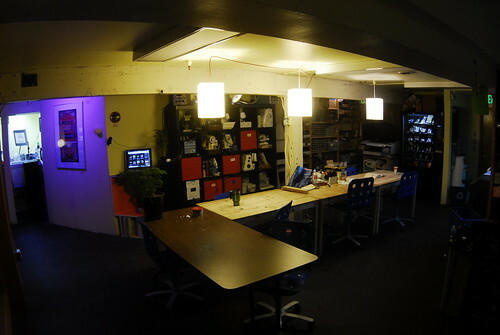 People at Metrix have neat ideas and try to make them happen, usually no matter the odds. I also chatted a bit with Plamena, the store’s newest employee. Since she interacts with many people who stop by, I asked her what newcomers are generally most surprised by. “People are really shocked that you don’t have to be a member. The fact that you can sit here, and it doesn’t cost you anything.” Most places of this sort operate on a membership only basis, and that’s actually what she thought Metrix would be like before she stopped by for the first time. She was looking to use a laser cutter, and found the place through the Internet. Since she started working there four months ago, she’s gotten to use all of the tools (I’m jealous! ), and has “met tons of cool new people”. I asked her what she thought the future of Metrix would be like. She said that she thinks the shop is going to become a much more fabrication oriented place, rather than just mainly electronics and robotics. “Some of the recent tools that we’ve acquired are allowing us to experiment with materials, various methods of production, and pushing new ideas of fabrication forward.” She’s been trying to push that experimentation with materials, and “taking things that are standard and using them, applying them in nonstandard ways.” Plamena thinks that fashion and industrial designers are seeing Metrix as a place that helps them realize their creative ideas. I’m so glad that Metrix has survived its second year! Not only has it allowed me to create things I never thought would be possible, there are new people every day discovering its amazing-ness. Here’s to another (at least!) two years!